"Youth was made not for pleasure, but for heroism" ~ Paul Claudel. In the spirit of wholesome adventure, TFP Student Action volunteers recently climbed some of the highest peaks of the Adirondack mountain range in New York state. The icy conditions and frigid weather presented an added challenge to the long trek. Already at the summit of these majestic peaks, a TFP banner for moral values was unfurled. 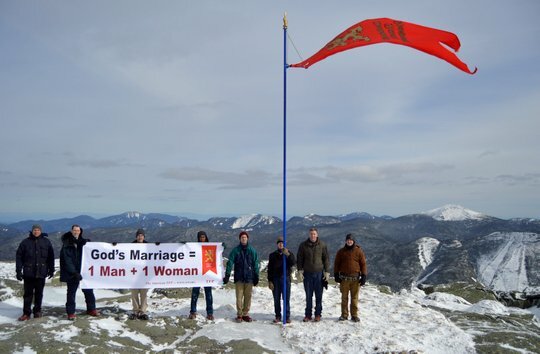 It proudly proclaimed: "God's marriage = 1 man + 1 woman." The TFP's trademark standard was flown too, catching the attention of several mountain climbers. The natural beauty of the snow-covered conifers, frozen waterfalls, and the immense variety of dazzling ice crystals, sparkling under the rays of the sun, reminded TFP climbers of God.